Greiving after the death of a close friend, company director Rhona Hartley was left further devastated when her hair began falling out in clumps, leaving her almost totally bald. 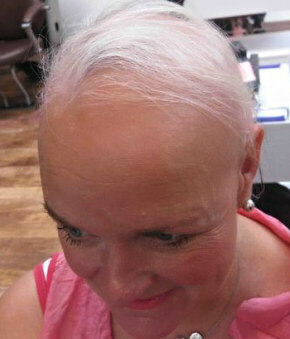 Rhona, 50, lost 80 per cent of her hair after developing alopecia. She first noticed a small bald patch at the side of her head but, putting it down to stress, she tried her best to ignore and disguise it. As the weeks passed, she watched it grow to the size of a 50p piece. 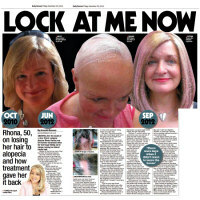 Rhona visited her doctor and was shocked to discover she had alopecia areata. Rhona said: "I had been going through a very difficult time and had just lost a close friend to leukaemia, so when I noticed my hair was thinning and falling out I told myself it would grow back." "But as the weeks went on, I noticed I was losing more and more. It got so bad I had a large bald spot." "I had never allowed myself to think that it could be alopecia so when the doctor told me that’s what it was, I was totally shocked." Having always been proud of her flowing locks, Rhona, of North Berwick, East Lothian, had to come to terms with gradually losing almost all of her hair. She said: "Every few months some hair would grow back but it was grey and very fragile and would often fall out. I had no idea how much my hair mattered to me until I lost it. My looks have always been important and I felt embarrassed, especially going to business meetings. My confidence was shattered and knowing there was no cure made it all the worse." "I had to deal with people staring and some asked if I had cancer. It was difficult but being a strong person I tried to get on with it. There were some days I didn’t want to leave the house." Rhona tried wigs but found them uncomfortable and resigned herself to living without hair. It was only after bumping into a neighbour, who has alopecia, that she realised there was a solution. She said: “She told me she had been going to Lucinda Ellery for 15 years and recommended her. My neighbour’s hair looked so natural that I thought I would give it a go." "I got in touch and found Lucinda really helpful and, after discussing all of the options, we decided that her Intralace system was the right treatment for me." 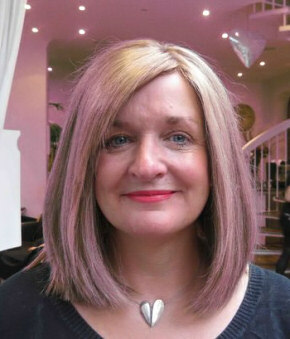 Rhona travelled down south to hair expert Lucinda’s studio in September and spent eight hours having her new hair fitted She said: "I couldn’t believe my eyes when I saw my new hair. It made me feel normal again. Suddenly I was able to brush it, flick it back, play with my hair or put it up in a ponytail – all the things that until you lose your hair you take for granted. " "The other bonus was that having it back made me look younger. I have a new-found confidence and feel I can enjoy a social life again." "I would say to anyone in a similar situation that there is light at the end of the tunnel. I only wish I had learned about Lucinda years ago." Lucinda and her team of 100 stylists use Remy cuticle hair, which is 100 per cent human. Her technique involves the root and hair being lined up in the same direction for a more natural look. With salons in LA, London, Manchester and, soon, Edinburgh, she works with women who have lost hair and those with short styles looking for extensions. Lucinda counts Cheryl Cole, Katie Price, Barbara Windsor, Sarah Harding, Peaches Geldof and Rachel Hunter among her clients. She said: "I first met Barbara Windsor 20 years ago. She was fed-up wearing wigs and wanted a more natural look. I also adore Cheryl Cole and Kimberly Walsh from Girls Aloud. Both come to my salon in London and are so down to earth." "We always have a good gossip but I never reveal any celebrity secrets. What I will say is I’ve heard it all – nothing shocks me." Lucinda knows only too well how losing hair can affect a woman’s confidence. She said: "At 10, I began to experience hair loss. I have experienced the taboo and anxiety associated with it and I’m so glad I’ve been able to help women like Rhona." "I was fed-up seeing ill-fitting hair extensions. I knew if I could get the root to join properly with the extension it would create a natural and fuller look." "You would think my hair is blonde, full and natural. In fact it’s short, black with bald patches." Now Lucinda is opening a salon in Edinburgh. She added: "I have a lot of Scottish clients who have to travel down south to see me."